When many of us think of golf, we think of executives on private country club courses or trips to Lake Tahoe or the Gulf shore. But there is an inexpensive alternative called disc golf, which has Newburgh resident Rick Mitchell very excited. First playing disc golf — which is similar to regular golf except small Frisbee-like discs are used instead of balls — at Coconut Grove, Fla., in 1981, Mitchell thought it was cool. Most golfers carry 15 to 20 discs that take different types of flights. Instead of putting a ball into a hole, disc golf holes are completed by throwing into hanging chains that stop the disc and allow it to fall into a wire basket. "Whenever I was in a town that had a disc golf course I would play," said Mitchell, who didn't become an avid player until Evansville got its first course at the University of Southern Indiana about eight years ago. Two years ago, he joined the local club, Ace Eagles Disc Golf Club, and has been playing seriously ever since. While disc golf is a sport most people may never have heard of, there are now courses at USI, Mesker Park near the Ampitheater, Atkinson Park in Henderson, Ky., and in Yellow Creek Park in Owensboro, Ky. Plans are being made for another disc golf course to be unveiled at the State Hospital grounds in Evansville this fall. About 100 people usually come to the tournaments, but there have been 300 or more participating at times. It is an inexpensive thing to do. Discs cost between $8 and $18. Mitchell says all you need is a putter, a midrange and a driver. No green fees are charged for disc golf. "Just show up and play," Mitchell said. "All you need are your discs." While you may help to be smart or athletic to play disc golf, you do not need a large bank account. LEICESTER, Mass. -- In many ways, Avery Jenkins and disc golf have grown up together. His parents picked up the sport in the '80s, planned family vacations to places where they could catch a tournament on the weekends and bought disc golf baskets for the backyard. Now Jenkins, 31, is closing in on his 10th year of traveling on the pro disc golf tour, making a living playing the sport. Jack McCluskey Instead of using a club, just pull your arm back and let 'er rip. "[Most] kids grow up playing basketball in the backyard," Jenkins said. "I was in the backyard shooting at disc golf baskets." This past weekend, Jenkins and his sister, Valarie, were two of 177 pros entered in the Vibram Open, the final stop on the Professional Disc Golf Association National Tour. With a total payout of almost $50,000, the Vibram Open is also one of the richest tournaments in disc golf. As defending champions, Avery and Valarie stood to pocket $2,500 and $1,500, respectively, if they could pull off repeats in Leicester. So although it was the middle of August, this Christmas tree farm -- the Maple Hill course is closed from Thanksgiving to Christmas so that people can cut and cart their own trees -- was bustling with activity. With the mercury climbing close to 90 degrees, and the sky high and cloudless, a group of about 20 people gathered at the top of a hill and waited for the clock to strike noon. Standing on the crest of the hill, backs to the trees lining the road, the spectators watched a red disc zip over rows of still-young pine trees and a green swath of grass sloping down the hill toward a medium-sized, lily-pad-dotted pond. They murmured approvingly as the disc settled softly onto the ground on the far side of the pond, just inside an overgrown, rutted cart path, in a landing zone marked with wood chips. It was a fine first shot for the man in the lime green shirt, Barry Schultz, who came into the final day of the three-round tournament at an astounding 18 under par. Schultz shot a 49 on the first day of play at the par-62 course, breaking the year-old course record of 51 set by, surprise surprise, Avery Jenkins. And he would go on to win the tournament in a runaway, finishing with a 25-under 161, 7 shots ahead of the rest of the field. His second shot would take him past the cart path, over more rows of young pines and into some open space lined with wood chips just before the tree-line proper. Past that open space was a square swatch that had been cleared from the full-grown woods and boxed in with planking. In the center of that swatch stood the pin, complete with a blue cloth flag with a white number 1 on it, flapping in the breeze. The only difference between this and a traditional golf pin is, on the pole hangs a metal basket, and hanging above the basket are a number of metal chains. This is the first disc golf basket, or Pole Hole. And it stood a mere 760 feet away from the tee box. For Schultz and the other top pros teeing off on the final card at noon, the distance isn't the hard part. A good driver will take care of the distance. It's making a good shot, avoiding the rows of trees, setting up a makable putt and, maybe most of all, keeping dry. After all, this is disc golf. And as Schultz said, holding up a driver disc, "Throw this in the water, you just lost your driver." As its name implies, disc golf pretty closely follows the rules of golf. The object of the game is to throw the disc into the basket in as few throws as possible. Each throw is made from where the disc came to rest on the previous throw; if the previous throw landed out of bounds (in the woods, water or in a snap trap), a penalty will be assessed and the next throw will come from a drop spot. The player with the lowest score wins. There is no exact date, time or place for the first disc golf game. What is certain is that the Frisbee, a federally registered trademark plastic flying disc made by WHAM-O Inc., was developed in 1958. In 1965, George Sappenfeld is credited with holding one of the first Frisbee golf tournaments, in Thousand Oaks, Calif. Eleven years later, Ed Headrick created the Disc Golf Association Company to manufacture discs and other equipment, notably the first target to use chains and a basket, which he trademarked the Disc Pole Hole. That same year, 1976, the Professional Disc Golf Association was formed, and the modern era of disc golf unofficially began. Although for many the phrase "disc golf" may conjure up images of long-haired hippies in tie-dyed T-shirts tossing floppy Frisbees off trees or telephone poles, the truth couldn't be more different. First of all, there's a big difference between your father's Frisbee and the discs used by competitive players. Discs are smaller in diameter and denser in composition, and have different aerodynamics -- they fly faster and farther than Frisbees and, thanks to advances in manufacturing techniques, hold their flight characteristics better after impact with a wall or tree or telephone pole. Although there are hundreds of colors and styles of Frisbees, they all do virtually the same thing in the air. Discs can be made so that they do very different things in the air. Some are sharper, heavier; these are drivers. Some are more rounded, smaller; these are putters. Next, consider the people throwing the discs. Although there is sure to be some long hair involved and although there may even be some hippies, there also are doctors and lawyers, teachers and plastics engineers, people from all walks of life. And the elite-level players are just that: elite. Don't think you can stumble out of bed onto a disc golf course and hang with Schultz, Jenkins & Co. Throwing a Frisbee may be easy, but throwing a disc down a hill, over a stand of trees and a pond and into position to make a second approach shot at a green box set inside the tree line of a woods is not. And although not all courses are set up like Leicester's Maple Hill course, the concept is the same. Frisbees are a hobby; disc golf is a sport. From the ground, through the air … into chains? Although the majority of the action in a disc golf tourney takes place in the air, the efforts to grow disc golf as a sport are taking place on the ground. "Disc golf is really a grassroots sport," said Brian Graham, executive director of the Professional Disc Golf Association, the sport's international governing body. "It grew up around the world by the hard work of volunteers." By and large, volunteers still do the vast majority of the work. The PDGA has only five full-time employees and three consultants, but "hundreds and hundreds of volunteers." To have a caddie, or not to have a caddie? Just like traditional golfers, professional disc golfers can have caddies to carry their gear during events. Unlike traditional golf, though, not many pros choose to do so on a regular basis. If that's the rule, disc golf professor Dave Feldberg is the exception. "I'm the player who carries the most discs," Feldberg said. "I carry between 30 and 40 discs. I'm also the only player who consistently has a caddie." Feldberg pays his caddies 10 percent of what he wins, which is a lot considering pro disc golfers don't always win a lot. But Feldberg says it's worth it, and not just because it's nice to have someone else carrying the bulk of the weight. "I don't need advice," Feldberg said. "I just need someone to rattle ideas off of. Someone to pump me up or calm me down." Avery Jenkins, the 2009 world champion, said Feldberg, a good friend, carries way more than anyone in the pro ranks. "I can make just about any disc do what I want," Jenkins said. "So I only carry 20 to 22 discs." Jenkins said he generally doesn't use a caddie but admitted that sometimes it's nice to have one. "I carried my own the entire world championships until the final holes, then I had my dad carry them for me," Jenkins said. It probably didn't hurt that his father has played disc golf himself since the '80s. Even in a singular sport, sometimes it's nice to have someone carrying part of the burden -- and sharing in the spoils. "We have 40,000 lifetime members in 28 countries," Graham said. "Just about anywhere you go in the country where there's a course or a tournament, there are PDGA members and disc players willing to help." Although the PDGA has been around since 1976, and disc golf itself has been around since long before that (although no one is sure exactly when or where the first disc golf game occurred), Graham says there's still room to grow. When the PDGA was founded, there was one dedicated disc golf course in the world. By 1980, there were 60. By 2008, the most recent year for which data is available, there were 2,748. In 2007, there were 11,943 PDGA members. A year later, that number had increased almost 9 percent to 12,980. The PDGA Tour has grown at an even higher rate, with events jumping 16.7 percent from 852 in '07 to 994 in '08, and total purses increasing from $1.7 million in '07 to just more than $2 million in '08. But all that growth didn't happen overnight. There have been delays and missteps along the way. "We kinda made the same mistake that soccer did," Graham said. "We started with a top-down approach." Much like the North American Soccer League's New York Cosmos trying to sell Americans on the game by signing Pelé back in the 1970s, disc golf tried to market its pros before it was even sure anyone would want to watch them. "There was a pro tour before people even knew what disc golf was," Graham said. So now Graham and the PDGA are taking disc golf to schools. A pro disc golfer named Jay "Yeti" Reading explained one such initiative, called Educational Disc Golf Experience, or E.D.G.E. "It's a complete curriculum for Grades 3 through 12," Yeti said at the Vibram Open, where he won the putting contest. "We give you everything you need to learn the techniques and play the game. "We're impacting an amazing number of kids right now. Our country is battling an epidemic of childhood obesity, and we think disc golf is a lifetime activity that can help kids develop a healthy lifestyle." After the tournament was over, Yeti, who has played disc golf professionally for the past 10 years, was flying to Texas to introduce the sport to 50,000 more schoolkids. And, it's possible that a student who learns about disc golf from Yeti in Texas goes to college and studies the sport with one of the top players in the world. That's because Dave Feldberg, a former world champion and still a topflight disc golfer, teaches a for-credit class on disc golf at the University of Oregon. "Disc golf is golf for the next generation," Feldberg said a day after finishing tied for sixth at the Vibram Open, shooting an 11-under 175, for which he received a check for $862. "It takes less time, less money, less land, less stress. Today's athlete? They're not wanting to put on dress slacks and traditional golf gear to go enjoy themselves with their buddies." "I was like a catfish, dude, swallowed it whole"
Billy Crump is nothing if not a salesman. "I drove 15 hours one way to be here," Crump said. "I'm not getting paid. Just to talk, because it had to be done." Crump is providing live blow-by-blow coverage of the tournament via webcast on the Open's Web site. "I'll talk for five and a half hours straight," Crump said. When he introduced himself, Crump said, "I'm the Nature Boy, and I can talk." Jack McCluskey Looks like a tricky shot, doesn't it? Nature Boy's story is a familiar one among the disc golf community. Some friends dragged him to a disc golf course several years ago, and he promptly failed miserably and declared the game "the stupidest thing I've seen in my life." Then he went back and played again and, as he put it, "I was like a catfish, dude, swallowed it whole." His pro career, to hear him tell it, was not exactly a huge financial success. His first year on tour, he made $200 and kept at it only because the guys he was traveling with were doing significantly better. They made sure he had enough to eat and enough for the entry fee to that weekend's tournament. "I always said, 'One day I'll quit playing and just cover you guys,'" Crump said, adding proudly, "I've been called the Jim Nantz of disc golf." Although he doesn't seem to have an official title or position with the PDGA, Crump acts as a one-man promotional department. He is a broadcaster, producer, ad salesman, marketing consultant and media director. "We all say we're on the precipice," Crump said, hoping this latest shove will push disc golf off the cliff and into the mainstream. He's not the only one selling the sport, however. Not by a long shot. "We all say, 'It's gonna be huge in three to five years,'" Avery Jenkins said. "We've been saying that for years." Vibram Open tournament director Steve Dodge said the disc golf community has debated what to call the kind of golf they play in the PGA. "I think we settled on 'conventional,' but you know that only works if ball golf is more popular," Dodge said. "Who's to say in 20 years this isn't conventional golf?" Ken Climo is to disc golf what Jack Nicklaus is to traditional ball golf. "When people try to compare me to Tiger, I say, 'Tiger hasn't broken the records yet,'" Climo, 41, said by phone from his home in Clearwater, Fla. "I think I'm the Jack. I've got the records, and somebody's gotta come get 'em." The records Climo was referring to include total tour wins (he has 220 and counting) and world championships (12, including nine in a row from 1990 to 1998). He also might own the record for reverential references by contemporaries and competitors. Jenkins, who won the 2009 world championship in Kansas City earlier this month, said he grew up idolizing Climo. Dave Feldberg was in awe of Climo's accomplishments, noting that no one is even close to Climo in total majors; Feldberg said he and Barry Schultz are probably closest at five apiece. Crump called him "a living legend" and pointed out a picture of Climo throwing a disc on the side of an Innova Disc Golf van parked at the Vibram Open. Disc golfers rejoice! EA Sports has added a disc golf feature to the Nintendo Wii version of "Tiger Woods PGA Tour 10." "Welcome to Disc Golf!" the demo screen on the EA Sports Web site reads, above a computer rendering of a blue disc with "EA Sports driver" written on it. "Are you ready to play one of the fastest growing sports in America?! Disc Golf is very similar to regular golf. The goal is to get the disc in the basket in the least amount of throws. Play on all courses. Have fun!" Using all the courses from the normal game, players will be able to play the courses using discs instead of clubs and balls. Legendary disc golfer Ken Climo says it's an exciting advance for the sport. "You can play Pebble Beach with a disc," Climo said. "That's gonna give our sport a lot of exposure." Will being featured in Tiger's newest video game be the push disc golf needs to hit the mainstream? Not so fast. After all, the disc golf option is on only one video game console. "It's baby steps," Climo continued. "It's gonna come, it's just gonna take a while. Ball golf is 400 years old, that's what I keep telling people. As a sport, disc golf is just more than 30 years old, that's not very old. We're basically just coming out of our adolescence." If adolescents with Wiis buy enough copies of "Tiger Woods PGA Tour 10" and play enough of the disc golf option, maybe the sport will enjoy another growth spurt. Only time will tell. Other pros have sponsors, but Climo has his own line of discs. That didn't come easily, though. Climo didn't get his current deal with Innova until after he'd won his seventh straight world championship. "I don't know what took them so long," he said, then laughed. Under the terms of the deal, Climo gets a quarter per disc sold in addition to a monthly paycheck. "It started out at a little less than $1,000 a month, maybe a little over $1,000 in the summertime when sales are good," Climo said. "Now I'll get checks for around $4,000 a month in the summertime." Although that might not sound like much, it's more than any pro disc golfer has gotten before. For the most part, sponsors still are making deals with players mostly for merchandise. They are small companies such as bottled-water distributor Brazilian Springs -- a proud sponsor of the Vibram Open. "For the most part, we've been successful on the regional level," said Graham, the PDGA executive director. "Though we do have one large company interested in us, asking lots of questions." The one-man disc golf salesman extraordinaire, Crump said he's been told "no" by more companies than he can remember. But, like most things in disc golf, there has been gradual progress. "Our sport is where traditional golf was in the '30s and '40s," Graham said. "Those guys lived out of the trunks of their cars, driving from tournament to tournament and barely making it." It wasn't always possible to make a living playing disc golf. In the beginning of his career, Climo built houses during the week and won tournaments on the weekend. Graham was a civil engineering designer for 23 years before being hired as PDGA executive director in 2007. Schultz was a plastics engineer back home in Wisconsin before he went pro full time. Sarah Stanhope, who won the women's division at the Vibram Open with a 9-over 191, is a high school science teacher in Greenville, S.C. But the success of pros such as Climo has helped pave the way for players such as Avery and Valarie Jenkins, Feldberg and Schultz to make a living off disc golf. "We're playing for more money. There are more sponsors," Avery Jenkins said. "When I started traveling in 2001, we were in a '71 Winnebago that got five miles to the gallon. We were making just enough to get from weekend to weekend. "Now we're not fretting about making it to the next weekend." Valarie agreed: "We're not buying houses or nice cars, but it gets us along." The Jenkinses have traded up from the Winnebago to a Ford Tioga motor home, complete with three beds, air conditioning and even a flat-screen TV hooked up to an Xbox and a Nintendo Wii. "Now we get about double [the mileage], 10 miles a gallon," Jenkins said. To hear most members of the disc golf community tell it, someday soon they'll be doubled in number. After all, they're right there on the precipice. All they need is that final push, one more toss. Then disc golf will really be airborne. The 2009 Ice Bowl, a local disc golf tournament aimed at raising money for charity, lived up to its name Saturday as Mother Nature was in full force with gusting winds and near-freezing temperatures. Playing under the motto "No Wimps, No Whiners," more than 30 disc golfers trekked through the heavily wooded Mesker Park disc golf course to raise more than $1,000 for the Tri-State Food Bank. With bulky shoulder bags filled with discs of different shapes, sizes and weights, players withstood the cold for two rounds of 18 holes. "We're out here braving the elements and rasing money for a good cause," said Nick Fest, president of the Ace Eagles. Fest said the 60-member organization hosts two other sanctioned tournaments every year and meets at Mesker Park nearly every week regardless of the weather. The tournament was part of an international campaign to help raise money for food pantries.The event started in 1987 near Kansas City, Mo., but has been adopted by more than 200 clubs worldwide. "People come out every year, and this has been a very successful event," said Mary Blair, executive director for the Tri-State Food Bank. Blair said the club presented the food bank with a similar donation last year. "It's 'addicing,'" one player said as he finished his last hole with a score of 15 below par. "It's 'addicing' and addicting." Butts said a portion of each $25 registration fee will be donated to the food bank, along with all $1 mulligan fees, personal donations and canned food. The Ace Eagles team also called local businesses for donations and asked participants to use mulligans liberally. Some players took more than a dozen mulligans a game, he said. "It's totally different playing for someone else instead of yourself," he said. "We'll keep coming out here for this every year, if we can." For the members of the Ace Eagle Disc Golf Club, passion and camaraderie is what unites them. Throughout three different seasons, the men and women of varying ages are out at the Kenny Kent Toyota Disc Golf Course at Mesker Park looking to shoot a low handicap. Local engineer Tommy Groves, 30, had the idea to start the league because he was convinced there was enough area interest in the sport. Now the Ace Eagle club consists of 60 members and is growing, according to Groves. "I did some research and looked around and found a way to play against each other, and using handicaps was a way to do this," said Groves. Groves said that he got into the sport because it's inexpensive and he lives close to a course. He learned how to play while he was attending the University of Southern Indiana (USI). The USI Recreational Center display case is where he buys his discs. "I just make the time to do this — you just can't beat it," said Groves. 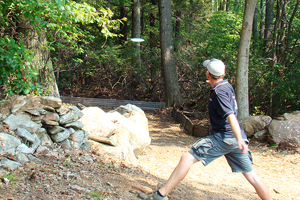 Disc golf is the same concept as regular golf, except it is played with discs that are thrown into baskets. There are three different types of discs: a driver, a mid-range, and putter. "A lot of top [disc] golfers will say, you give me a good golfer and I'll make him a good disc golfer," said Jack Rudibugh, 54, a plant manager in Evansville. Rudibugh became interested after talking with his nephew, who also plays. He has been playing for a year and a half and has an entire DVD collection and 95 discs as his proof of devotion. He has played at 58 courses nationwide. "I played disc golf on my anniversary. We saw Broadway shows and golf courses," said Rudibugh, who competed in his first tournament at USI. That's where Rudibugh met the youngest member of the club, Aaron Diehl. The 15-year-old Diehl is a freshman at Memorial High School. Like Rudibugh, he has competed on courses in several states, including Florida, Kentucky, Tennessee, and Illinois. "When I get a car I'll play more," said Diehl. Other than the current winter season there are also seasons in the fall and spring and a tournament in November. Groves said the Pumpkin Shootout tournament drew 90 competitors last year. For the current season there are 14 members and the cost is $4 a week. The club has weekly competitions beginning at 1 p.m. on Saturdays. If a person is interested in joining, the registration fee is $10. The club even awards prize money. "There's something about the beauty of just throwing the disc and seeing it go where you want it to land," said Rudibugh. For more information, go to the Ace Eagle Club website at www.aceeaglediscgolf.com or check out the Pro Disc Golf Association (PDGA) at www.pdga.com. Perry Central students take aim at a metal cage during a disc-golf demonstration March 13. Alumnus Ben Verkamp is an avid player and participates in regional tourneys. He predicts the sport will continue to gain popularity. Hard plastic discs come in various colors and hardness and many disc-golf players develop a preference, Verkamp said. Since many courses incorporate trees as obstacles and the discs are thrown at metal cages that serve as "tees," they often take a beating. LEOPOLD - Ben Verkamp hopes the gym-class introductions to disc golf he provided to some 300 Perry Central Elementary School students this month will help propel the local popularity of the sport he plays with a passion. A Perry Central alumnus, Verkamp spent a week at the school substitute-teaching gym classes and showing students the basics of disc golf. Similar to traditional golf, in which players hit balls toward tees, disc-golf enthusiasts throw hard-plastic Frisbee-like discs at stations. The fewer number of tosses a player takes to hit the above-ground targets, which are often metal baskets, the better the score. "You're finding more and more courses in our area and once people try it, they're often hooked," Verkamp said during a morning class March 13. Verkamp has helped design courses in the area and has talked with County Park and Recreation Department Director Dan Adams about the chances of a local course being built here. The sport is good exercise, Verkamp explained, since throwing the discs uses most of the muscle groups in the upper body, including arms and shoulders. VINCENT PUGLIESE / Courier & Press David Rudibaugh launches a golf disc during the 3rd annual Ice Bowl by the Ace Eagle Disc Golf Club on Saturday at the Mesker Park Disc Golf Course. Proceeds from the event go to the Tri-State Food Bank. The thermometer showed 13 degrees, but the 10 a.m. winds blasted the temperature index to zero for Saturday's 2008 Ice Bowl, a disc golf tournament with the official motto: "No Wimps, No Whiners." Austin Butts tries to keep warm as the cold winds swirl around the Mesker Park Disc Golf Course during the 3rd annual Ice Bowl on Saturday. For more than two hours, 28 disc golfers — some from as far as Owensboro, Ky., and Harrison County, Ind., — crunched through the inch of frozen snow crusting hills and hollows of Mesker Park's wooded course to complete 18 holes of disc golf and help raise more than $1,000 for the Tri-State Food Bank. They stamped feet, rubbed gloves together, and blew billows of frosty vapor from mouths and noses as they waited their turns to "drive" or "putt" discs slightly smaller and shallower than recreational Frisbees. Then, one by one, they took off a glove, focused their gaze, held their breath and flung their colorful plastic saucers toward, and eventually into the course's 18 "holes" — elevated steel baskets draped in chains. Selecting from bulky fanny packs stuffed with brightly colored discs, the two-member teams chose hard, shallow "drivers" for long throws, midrange discs for intermediate distances, and softer "putters" when they got close enough to sink their saucers into the chained baskets. Most players belonged to the Ace Eagle Disc Golf Club, the 50-member organization whose members play the Mesker Park course at 2 p.m. each Sunday. Saturday's tournament was part of an annual, international campaign to promote the sport, get people out moving and playing in the cold, and raise money for local charities. Begun in 1987 at a disc golf park in Columbia, Mo., the event has evolved into an annual charity event organizers say raised more than $200,000 in 202 locations last year. This year's Ice Bowl participation is even bigger, with 222 events in 44 states, six Canadian provinces and in Finland, Germany and Norway. Ben Verkamp and Mike Weidner, Ace Eagle members from Evansville, won this year's Evansville Ice Bowl, with a 14-under-par score of 40. Their prizes included trophy discs and folding tripod seats. Nearly everyone who finished won a prize, however, and all the participants shared a post-tournament lunch that included chili, cheese dips and hot dogs, served beside crackling fires in one of the park's stone shelter buildings. Mary Blair, director for the Tri-State Food Bank, stayed in the shelter house to prepare and serve food, but she represented the event's ultimate winners —the families receiving food purchased with the funds raised by the Ice Bowl. Organizers hoped to raise $1,200 this year in registrations, donations and "mulligan" fees, said John Barabe, the event's coordinator. He hadn't tallied all the income by noon, Saturday, he said, "but we're probably beyond that already." A spectator watches two “golfers”debate if they can make the tee during the Brandenburg Open over the weekend. In addition to the picnicers and those enjoying the weekend weather, nearly 100 disc golfers called Meade Olin Park home this weekend. The 16th annual Brandenburg Open, otherwise known as the Larry Mehal Memorial Tournament, offered four rounds for competitors at the park’s field. Mehal was a good friend of event co-coordinator Eddie Whelan, and used to cook for the club during the tournaments. Mehal passed away following injuries in a car accident, Whelan said. 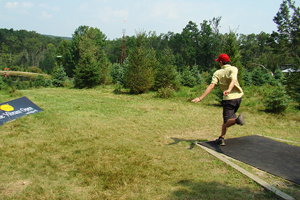 According to the Professional Disc Golf Association, disc golf is played much like traditional golf, but instead of a ball and clubs, players use a flying disc. The sport, formalized in the 1970s, shares with “ball golf” the object of completing each hole in the fewest number of strokes (or throws). A golf disc is thrown from a tee area to a target, or basket, which is the hole. As a player progresses, they must make each shot from the spot where their previous attempt landed. The trees, shrubs and terrain changes around the fairways to provide challenging obstacles for the golfer. Finally, the “putt” lands in the basket and the hole is completed. The event shares the same joys and frustrations of traditional golf, whether sinking a long putt or hitting a tree halfway down the fairway. Photos by Larry See Jr.
Ben VerKamp of Evansville tries his luck at getting the flying disc into one of the baskets during the Brandenburg Open Sunday afternoon. Beautiful weather welcomed the 100 participants to the Meade Olin Park course. On the plus side, disc golf rarely requires a greens fee, you probably won’t need to rent a cart and you never get stuck with a lousy tee time. This event, coordinated by the Louisville Disc Golf Club, is one of several events the club hosts locally. They are working closely with the Louisville Metroparks and host a tournament at Otter Creek and at the Muldraugh course. Whelan should know. His business, Rivertown Spirits, also stood to gain from the event. Event co-coordinator and area resident Jeremy Watts said this tournament is a “B’ tier, with the next highest one being the “A” tier. Mark Priddy, Louisville, gauges the distance before tossing his “ball” toward the tee. Participants came from throughout the area. The purse was $1,560. “The first place position will pay $420, which is not bad for the weekend,” Watts said. Watts said 29 intermediate players registered for the event, which shows the event’s popularity is not waning. “The sport is really growing considering that we have that many in one division,” Watts said. Watts admitted he spends every waking moment at the park, especially when not working at the nearby Arch Chemical plant, but does not hold the course record. Josh Pemberton even walked off with a $100 bounty after scoring a deuce on hole ten. A wide array of prizes were given away at the event’s conclusion. In addition to prizes, monetary awards were offered in some divisions. ‘They got a $100 bounty for that hole and someone(Pemberton) hit it,” Watts said. Watts said Meade Olin was one of the nicest parks in the area. “We usually get more players when we have a tournament at Otter Creek, but that is listed as Louisville,” he said. “The Otter Creek tournament is held earlier in the year. The PDGA estimates there are over 16,000 members involved in the sport. The PDGA sanctions competitive events for both men and women of every skill level, from novice to professional. Evansville, Ind., wins in our readers' choice poll of favorite places to live, work and play. On the banks of the Ohio River in southwestern Indiana, Evansville has plenty of amenities you'd find in a bigger town. For example, the Evansville Museum of Arts, History & Science houses a $10 million permanent art collection. The Centre, a 2,500-seat auditorium, brings in Broadway touring acts. And the Evansville Philharmonic Orchestra performs with such renowned musicians as Grammy Award-winning violinist Joshua Bell. There is a lot of outdoor recreation nearby: Paoli Peaks ski resort, state and national parks, lakes and, of course, the river. "I don't have to take a vacation to have a good time," says resident and native Mike Zimmer. Although not as low as any of the other Best Cities selected by Kiplinger's Personal Finance, the cost of living in Evansville is below the national average, and the median home price of $109,682 is about $100,000 less than the national median price for metro areas. A new, four-bedroom home goes for around $150,000. The real deals, though, are on brick-paved First Street in the historic district downtown, where you can find beautiful 4,000-square-foot homes in good condition for less than $300,000. Like many of Kiplinger's Best City picks, Evansville is witnessing redevelopment of its downtown. The city saw a steady decline in population since the 50s as people moved to the suburbs, says Mayor Jonathan Weinzapfel. But revitalization efforts in downtown neighborhoods reversed that trend in 2007, when the city's population actually increased. As testament to the city's downtown redevelopment efforts, loft apartments now are filling once-vacant buildings. Two corporations, Berry Plastics and American General Finance (a division of AIG), are building their headquarters downtown. Casino Aztar, the city's biggest tourist attraction, built a $40 million entertainment district that includes a boutique hotel and hip lounge. And individuals and corporations chipped in more than $4 million to help build the Koch Family Children's Museum of Evansville in the former Central Library downtown. A pedestrian and bicycle trail now runs the length of downtown along the river. The city installed this first 4.2-mile section of Pigeon Creak Greenway in 2007. When completed, the trail will be 42 miles, encircling the city. The single best thing that has happened to Evansville, though, was the opening of a Toyota plant in 1996 in nearby Princeton, says Zimmer, who is an economics professor at University of Evansville. With about 4,600 employees, it's the area's biggest employer. Toyota also has provided a stabilizing influence in a city that had a history of union troubles, Zimmer says. Although manufacturing still dominates the area, Evansville is becoming a mini financial center and a regional health-care hub. And the city's two universities, University of Evansville and University of Southern Indiana, provide an educated workforce. "Evansville,home of the Ace Eagle Disc Golf Club. :) "